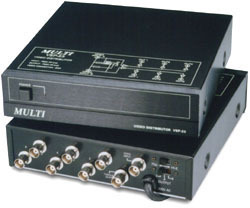 The model was designed for full brand of UHF and support to system of NTSC-M, B and PAL-I, D for most countries use. 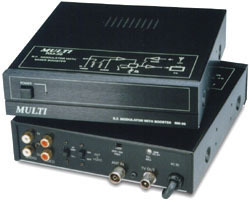 Easy to programme the channel. Build in video lamping and White Clip Circuit. Video carrier control by PLL synthesieer and vias l IC bus. Video and power are supplier from the VSW-440 video switch camera drive unit via a single coaxial cable , there is no need for external power cable. Maximum cable length between camera and video switch is 200M with coaxial cable (RG59/U) type. 4 cameras input for DC12V camera 500mA, if the camera is AC220V~AC240V, please direct to connect the camera , (no need the video modem)from the VSW-440 video switch. The video input is turn the selector switch to 0V. Multi-in sequential switch with adjustable Dwell time 1’S~60’S, bypass are programmable. 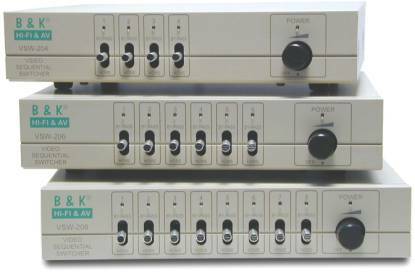 Video Sequential Switcher provides both manual and automatic sequential switching for 4, 6, 8 camera input. Continuous camera identification is made on the front panel with LED indicator. Simple front panel controls insure easy operation. 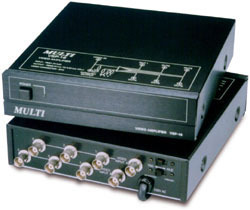 They include, variable dwell controls, each channel with 3-position slide switch for BYPASS, AUTO and HOME function.